Join the discussion on our forums! Come discuss Loose Specimen over in our dedicated Loose Specimen discussion topic. Has anyone managed to have any success with this and Blackhowl Gunspire? 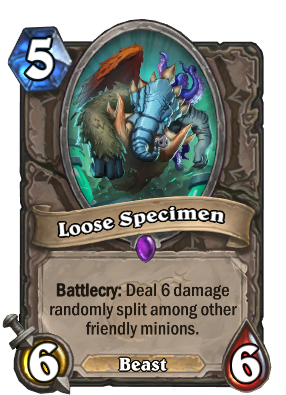 Use Helpless Hatchling to discount this to 3 mana then play Blackhowl Gunspire + Loose Specimen for 10 mana and 18 damage randomly split amongst all enemies (as long as your board is empty). Hard to pull off but it's a guaranteed way of getting value out of Blackhowl Gunspire. I have pulled this combo off a few times but only once it actually won the game for me. It is far from reliable when it comes to face damage as you can't count with your opponent's board being empty but just clearing a few minions and getting some face damage when they are fatiguing can be enough to seal off the game. You can also use Alexstrasza to reduce their health (or increase yours). However, this is too slow and unreliable with the amount of otk decks on the ladder. So i wouldn't count this as way of making Gunspire viable yet. Turn 5: Loose Specimen for a 20/1 and a 6/6. "Other" Minions really does mean other minions, it will NOT damage itself! to use on all your Goblin Bombs. I think you need to re-read the card. "Whenever this minion takes damage" synergy. You know what card I'm talking about, I don't need to give you any more text. 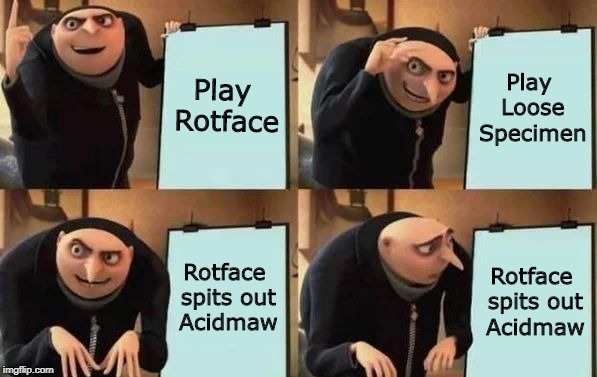 All I need to tell you is that this probably won't see any play because of the 5 mana price tag, except in Rotface memes. You'll believe me, not understanding why, then move onto the next card of this expansion. Great synergy with enrage minions or minions that activate an effect upon taking damage (Rotface, Blackhowl Gunspire). Can be played on an empty board with no downsides as well. Works for constructed and it is definitely a worthy pick for arena. An Eternium Rover that's been magnetized to something. This could be a good tool for an Odd Armor Control Warrior, note how most of the warrior mech cards are odd. Honestly the downside for this card is next to nothing if you play it right. Just trade off your own minions first, then play an overstatted minion. You can also play it on an empty board, or with minions that combo with damage/destruction. Even if you can't efficiently trade off the minions currently in play, a 6/6 is probably better most of the time then what you have early on. And in the later stages of the game, it's cheap enough to also follow up with some other card play.